It had been less than 24 hours since I clicked that little green check mark. My mind was consumed with some random guy who apparently was playing basketball halfway around the world. Seriously, Courtney?? Like no... seriously?? Pull yourself together and get on with your day. It was probably a mistake anyway. He didn't mean to follow me. He thought I was someone else. Phew. Glad I can move on now. My heart wouldn't let me. Something deep in my soul was stirring. I couldn't shake this guy from my mind. Why did he want to follow me? As my thoughts grew louder and more crowded, my heart responded with equally as fast thumping. UGH. FORGET IT! I have to know. Leonardo DiCapprio's character on We Bought a Zoo was quoted saying, "You know, sometimes, all you need is twenty seconds of insane courage. Just literally, twenty seconds of embarrassing bravery. And I promise you, something good will come of it". I acted quick and out of insane, embarrassing bravery. I pulled out my laptop, hopped on to google and began "researching" (aka girl code for stalking the man of her dreams). I googled him; I watched videos on him from his college basketball days. I ohheed and awwwed over the images google search brought up, and I even read about him on Wikepedia. Ever come across THAT guy who kinda has it all? Like your dad and brother would be his bestie, his heart for Jesus is pure GOLD, and you can't help but go googley-eyed over his athleticism and looks? 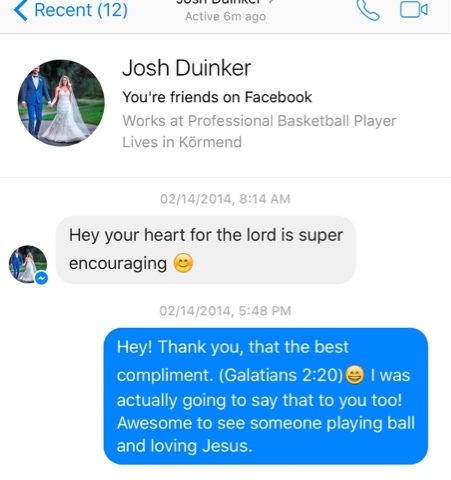 Josh Duinker was THAT guy. As I dug a little deeper, my heart grew connected. It was speeding down the train tracks of love, marriage, and happily ever after. The worst part?! I actually FRIENDED HIM ON FACEBOOK! Facepalm. Remember that little bravery talk we just had- this was my twenty seconds of embarrassing bravery. I made up in my mind that if he meant to friend me, then he would accept my friend request. If he SOMEHOW, like ONE in a MILLION chance, thought I was cute, then he would accept my request AND message me. The notification popped up: "Josh Duinker has accepted your friend request". My eyes went to the corner at the top of my page where the little box sat. PLEASE... please little red number 1... please pop up. Just as I was about to pass out from holding my breath, my silent prayer and hope was answered. The little red number 1 appeared. Should I look? Should I play it cool and check it out later? Do I respond right away? I wonder what he said? I silenced the voices in my head who were in down-right panic mode. I went for it. It was from HIM!!! Heart picks up triple time. With just 9 words, from a total stranger, our story began.